Today I've been reading about coaching and about the importance of setting goals - or more to the point helping the person setting being coached to set his or her goals. Even at the level of an individual coaching session, it's important to let the coachee decide what exactly s/he wants to get from the coaching. In the book Coaching for Performance, John Whitmore defines various different goals for coaching. Most people who are being coached will have some kind of an end goal in mind. For teachers this could include student learning goals like getting their students involved in global collaborative projects, having them advance in their reading level, having them try out different genres of writing and so on. Or it could be a teaching goal for example personalized learning for all their students. The important thing about an end goal is that it is often not completely within a person's own control. This brings us onto performance goals - and these are within your control. A performance goal is one that leads you to your end goal, and it is one that you can measure in order to assess your progress. Let's say, for example, that you want to be able to personalize learning for your students (the end goal). 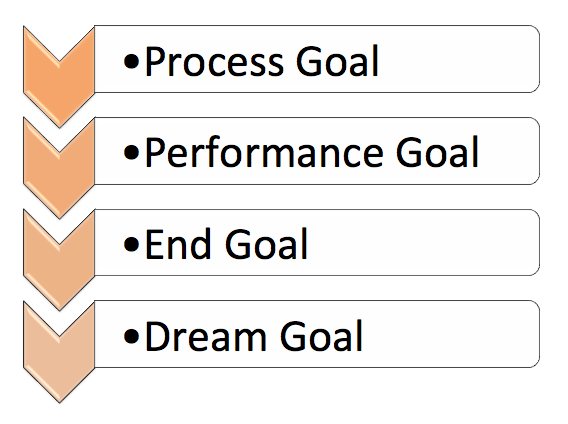 You can come up with a performance goal that will help you to achieve the end goal. A performance goal is always within your grasp and so it's easier to take responsibility for achieving each performance goal than for achieving the end goal. A performance goal might be to give students more voice and choice in the summative assessment for an upcoming assignment. Another type of goal is a dream goal - which is a the thing that inspired you in the first place. In the case of education it could simply be that you wanted to make a difference in a child's life, you want to inspire your students to reach their full potential and so on. It's the dream goal that makes us willing to invest ourselves fully in the process. Process goals are the steps you take in order to reach your performance goal. In the example above of differentiating learning, this could be the individual lesson plans that a teacher is making on a daily basis to work towards personaliation. Ownership of goals is very important. Whitmore writes that managers often pass their own goals down the line "as imperatives not to be questions. This denies ownership to those who are expected to meet the targets and their performance is therefore likely to suffer ... the value of choice and responsibility in terms of self-motivation should never be underestimated."